Based on the DC Comics character and Warner Bros. film starring Ryan Reynolds, Green Lantern: Rise of the Manhunters follows the exploits of test pilot Hal Jordan, who becomes the first human inducted into the Green Lantern Corps after accepting a dying alien's power ring. An enemy known as Parallax is in control of a robotic army of Manhunters sent to eliminate the Green Lanterns. Jordan must join forces with fellow Lanterns Sinestro and Kilowog to defeat Parallax and save the universe. Use the multifaceted power ring to fire energy blasts and conjure more than 12 constructs to attack or defend in brightest day and in blackest night. With beloved childhood memories of the old Comics, my husband was thrilled when they announced that Green Lantern was hitting the big screen this Summer! He promptly took our son to see it on opening weekend! Instantly gaining a new young fan, our son is now entranced by all things Green Lantern! 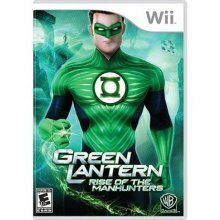 The new Green Latern: Rise Of The Manhunters Game for NintendoWii allows him to step right into the world of his new favorite Super Hero's. Green Lantern: Rise of The Manhunters for Nintendo Wii offers various levels of gaming fun-in which the player must ultimately defeat Parallax to save the Universe. The detailed graphics and incredible animation is sure to capture the players attention. Timeless Super Hero gaming fun for both the young and the young at heart.